We posted a quick mention of the Boogie Board RIP at the end of 2011. Many of you emailed us asking what we thought of the device. Well, we are happy to report that the RIP is exactly as we had hoped…an easy-to-use digital sketchpad which can save the drawings and transfer them to the computer for further manipulation or to share with others. We have no idea how the image capture is being accomplished. Our guess is that there is a pressure-sensitive layer underneath the LCD panel which is detecting and recording the strokes. This conclusion was based on our observation that light strokes, while clearly visible on the LCD layer, are not recorded by the tablet. For the marks to be recorded, a firm stroke is required. We don’t see this as a problem (since it is not possible to make shades of gray on the LCD anyway) so the adjustment of having to make a slightly firmer stroke soon became second nature. When we inquired as to what technology Improv Electronics used for the RIP, the response was “…the RIP does not use a resistive touch screen to capture the images. We are currently using an electromagnetic pen and digitizer solution for recording the pen strokes.” This means that you can make a mark on the LCD screen using any stylus, but the recording of the stroke only happens when using the pen designed specifically to work with the RIP. Transferring the saved images to the computer could not be easier. The connection is via a standard USB cable. The RIP appears on the desktop as just another storage device. 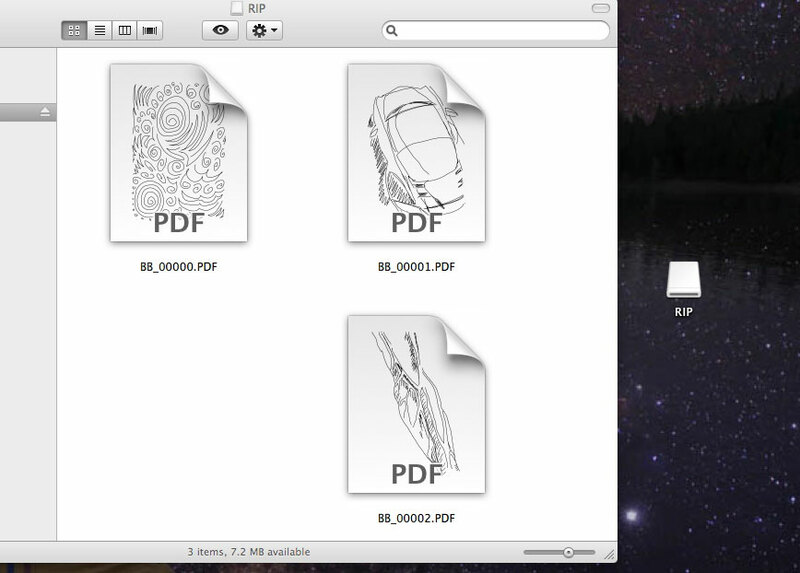 The files can be drag-n-dropped to the desktop or a folder just like a file from any other external device. Double-clicking the file will bring it up in any .pdf reader. To edit the image, Illustrator or a number of other capable programs will let you get the job done. While everyone is touting the RIP as an alternative to a notepad, we take a slightly different view. It is not really that great for taking notes as it was difficult to use OCR software to convert the .pdf image into electronic text. 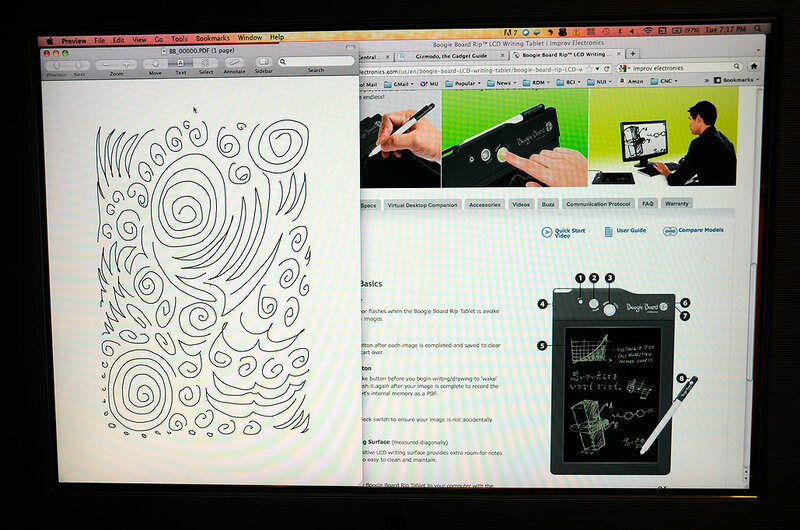 What we have found was the “Save” feature made the Boogie Board into a great outline tracing device. Those of you who were around before digital scanners will remember tracing paper. The technique was widely used and special papers were available to facilitate the practice. Photocopiers and digital scanners have pretty much made tracing obsolete. While the RIP may not revive the practice, it has sure made it easy…and a lot more fun. Of course, we could trace with the original Boogie Board, but without the ability to save the tracings…what was the point? Now that sketches on the Boogie Board can be saved and transferred to the computer, tracing things with the tablet made perfect sense. Unlike with tracing paper, tracing 3D objects are just as easy as that with 2D images on a page. Improv Electronic’s RIP is an interesting device. 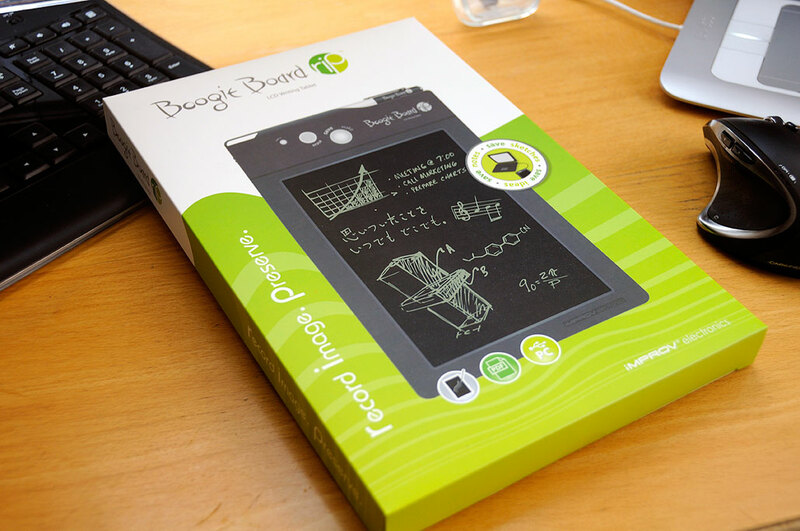 The original Boogie Board was a fun message pad, but now with the “save” feature, it is getting closer to being a true sketch pad. The next item on our Boogie Board wish-list? Gray scale capabilities. We have no idea how they would manage that and still keep the cost from going up into Wacom tablet territory, but if they can pull it off…watch out!